a. The rope should not be stepped on or dragged on the ground unnecessarily. 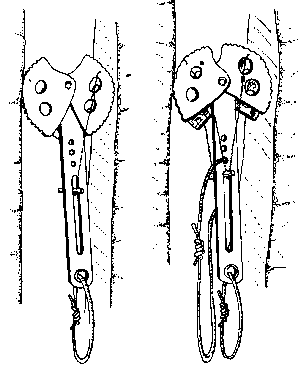 Small particles of dirt will get into and through the sheath causing unnecessary wear to the rope within. b. The rope should never come in contact with sharp edges of any type. Nylon rope is easily cut, particularly when under tension. If a rope must be used around an edge which could cut it, then that edge must be padded or buffed using fire hose if available, or several small sticks. c. Keep the rope as dry as possible. If it should become wet, hang it in large loops, above the ground, and allow it to dry. A rope should never be dried out by an open flame, or be hung to dry on metal pegs, as this will cause rust to get in the rope thus rendering it unserviceable. d. Never leave a rope knotted or tightly stretched longer than necessary. e. When using rope installations, never allow one rope to rub continually against another. NOTE: With manila ropes this will cause the rope to fray, whereas nylon ropes can melt under the friction that this causes. f. The rope should be inspected prior to each use for frayed or cut spots, mildew, rot or defects in construction. g. Mark all climbing ropes at their midpoints to facilitate establishing the midpoint for a procedure requiring you to use the middle of the rope. The rope should be marked with a bright colored adhesive tape. h. The rope should not be marked with paints or allowed to come in contact with oils or petroleum products for these products will weaken it. i. A climbing rope should NEVER be used for any other purpose except for mountaineering, i.e., towing vehicles. j. The ends of a new rope or ends caused by a cut should be cut with the rope cutter contained in the MACK and marked with a serial number. k. The rope should never be subjected to high heat or flame as this can significantly weaken it. 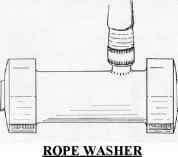 l. To clean rope use mild soap and rinse thoroughly with water. A rope washer can be used to clean or rinse the rope. m. When not in use, ropes should be coiled and hung on wooden pegs rather than on nails or any other metal object. They should be stored in a cool place out of the direct rays of the sun. n. When in areas of loose rock, the rope must be inspected frequently for cuts and abrasions. o. Always maintain an accurate Rope Log whenever using a rope. p Ropes 300-600 foot in length should be Mountain Coiled.